Smith's Instant Win Game: Play Daily through May 7th! *OVER* 12 Days of Giveaways Day 12 - Enter to Win a $75 American Girl Gift Card! *OVER* 12 Days of Giveaways Day 11 - Enter to Win a $40 Fiiz Gift Card! *OVER* 12 Days of Giveaways Day 10 - Enter to Win a $50 Amazon Gift Card! How To Drop Your Gym Membership and Exercise For FREE! Dole Canned Pineapple & Tropical Fruit $0.75 at Smith's! Pillsbury Crescents, Sweet Rolls & Grands! Biscuits $1.34 at Smith's! Jimmy Dean Fresh Sausage Rolls $2.50 at Smith's! The Color Run Coupon - Best Deal! South Valley Services Medicine & First Aid Supplies Donation Drive (March 15th) in West Jordan! Creative Easter Basket Ideas Under $10! Ways to Save Money On A Child's Birthday Party! Pistachio Pudding Dessert - Perfect for St. Patrick's Day! Utah Renaissance Faire Coupon - Family or Date Night Fun! Baskin Robbins Coupon: $1.50 Scoops Today 1/31! Dog Haus Coupon (Sandy) - Hot Dogs, Sausages & Burgers! Smith's 3 Days of Digital Deals: April 19-21 ONLY! Content may be sponsored or contain affiliate links. View full disclosure. I've had a horrible chest cold. You know, the kind where you wish you could curl into a ball and hide from the world! I love a good hot bath when I have a chest cold. Sometimes it's the only thing that can relieve my achy body. 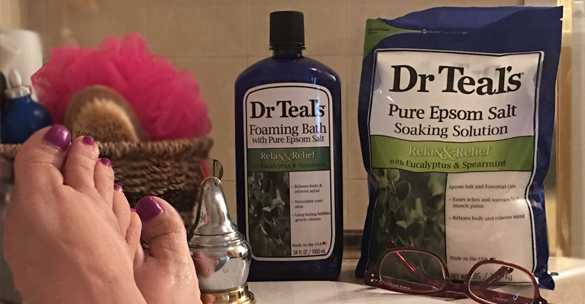 While I was out stocking up on cough meds, I stumbled on this Eucalyptus and Spearmint bath product called Dr Teal's. I used to have a menthol bath product I loved, but haven't been able to find it again, so I decided to give this one a try and I LOVE it! While they make no claims on the package to help with a cold, I could feel the scent immediately giving me relief. If you are suffering from a cold you may want to pick some up. I found the best price is currently on Walmart.com for $4.87 (choose to pick up in-store at your convenience). They have Body Oil, Bath Bombs, Lotion and Bubble Bath, but I found I like the Epson Salt best. Dr. Teal's also comes in other scents like Coconut and Lavender too. I think the Coconut sounds luscious. Money Saving Tip: On the Epson Salt, the directions say to add 2 cups. I found that about 3/4 of a cup worked just well. I recommend you start with a smaller quantity and adjust accordingly. Posted by Joani. Not-sponsored by Dr. Teal's. We love comments from readers, so please chime in with helpful suggestions! In order to keep the blog upbeat and informative, we ask that you keep your comments cordial and relevant to the post. Read more information on our comment policy. Want more news about activities going on in Utah? Join our Facebook Group.